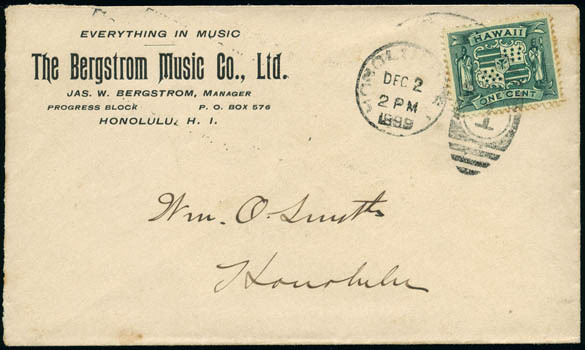 The Bergstrom Music Co., Ltd., Honolulu, H.I., corner card and all-over illustrated ad showing the Crown Piano on reverse of cover to Wm. O. Smith, Honolulu bearing 1¢ dark green (80) tied by "Honolulu, H.I. Dec 2, 1899" duplex. Peters-Uota No. BMC-IL-1 Estimate $500 - 750. A VERY RARE EXAMPLE OF THE BERGSTROM MUSIC CO. ILLUSTRATED ADVERTISING COVER. 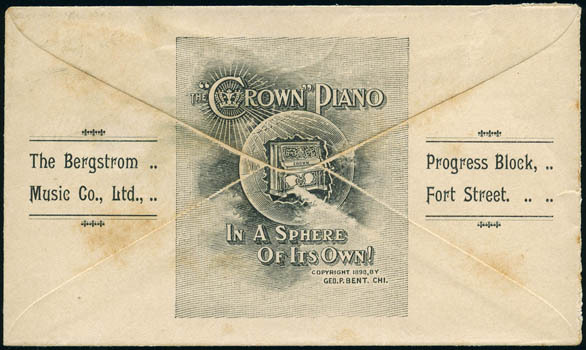 This corner card cover comes with and without the illustrated ad for the Crown Piano on the reverse. Bolles & Co., Honolulu, H.I. 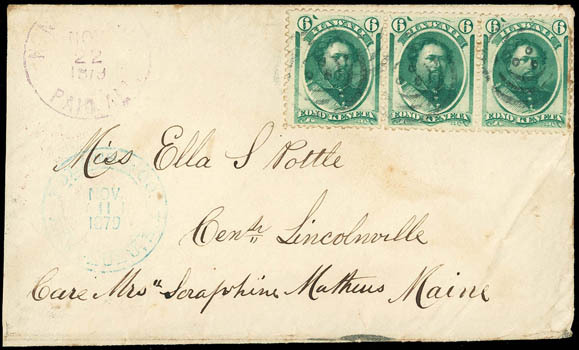 Nov 11, 1879, blue double-circle company handstamp on cover to Lincolnville Center, Me. bearing 6¢ yellow green (33) strip of three tied by three strikes of patent cancel (Gregory ring3-21(patent)), partial strike of purple "Honolulu, Paid All, Nov 22, 1879" cds (MH #237.12, R2); reduced slightly at left, F.-V.F. Peters-Uota No. BOL-HS-1 Estimate $500 - 750. THE ONLY RECORDED EXAMPLE OF THIS BOLLES & CO. COMPANY DATESTAMP. 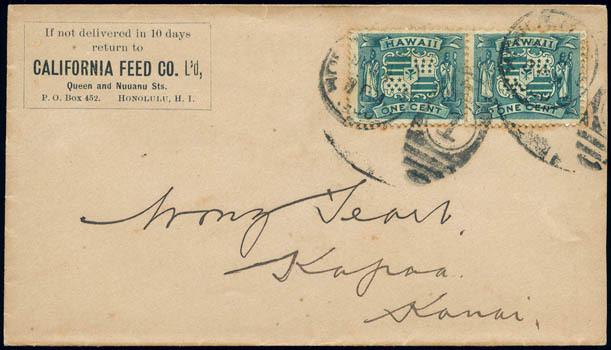 California Feed Co. L'd, Honolulu, H.I., framed corner card on cover addressed to Wong Feart, Kapaa, Kauai bearing 1¢ dark green (80) horizontal pair tied by two strikes of "Honolulu H.I., Jun 4, 1900" duplex, light overall toning, otherwise Very Fine. Peters-Uota No. CFC-CC-1 Estimate $200 - 300. A.S. Cleghorn & Co., Honolulu, H.I. Jan 5, 1884, blue double-oval company handstamp on 3¢ green (UX3) to Denmark cancelled with San Francisco circular grid cancel, red "San Francisco Cal. Stm. Ship Jan 22" cds and Copenhagen (2.12) arrival cds; small card flaws, F.-V.F., a very scarce use. Peters-Uota No. ASCC-HS-1 Estimate $300 - 400. A.S. Cleghorn (1835-1910) was born in Edinburgh, Scotland and in 1851, Cleghorn traveled with his parents to Honolulu, where his father established a dry goods store. His father died within the year, and his mother left for New Zealand, but Archibald remained in Hawaii and continued running the store. His business prospered and he expanded to other islands. With a Hawaiian woman, Elizabeth Lapeka Pauahi Grimes, Cleghorn had three daughters, but later separated. In 1870, Cleghorn became a citizen of the Kingdom of Hawaii and married Princess Miriam K. Likelike, sister of David Kalakaua, on September 22, 1870 at Washington Place. In 1874 Kalakaua became King, and Cleghorn's daughter Princess Victoria Kaiaulani was the heir to the throne of the House of Kalakaua. Cleghorn served in the House of Nobles from 1873 to 1888, and the Privy Council from 1873 to 1891. He acted as the Royal Governor of Oahu in July 1887, and was appointed to succeed Prince Consort John Owen Dominis upon his death in November 1891, serving until February 28, 1893. 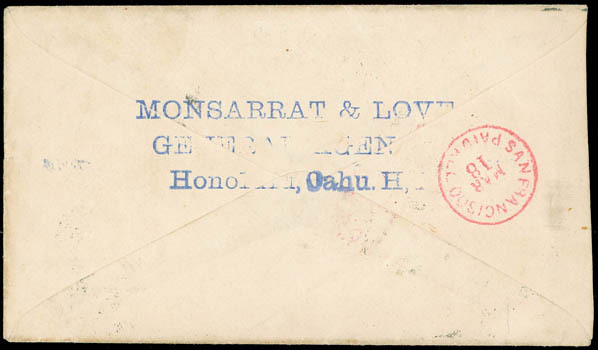 The Crystal Soda Works, Honolulu, H.I., printed script corner card on cover to New Lisbon N.J. bearing 5¢ ultramarine (39) tied by bold target cancel, light strike of Honolulu cds adjacent and purple "Late Letter, Mail" circular handstamp (MH #759, 1RRR), reverse with red San Francisco (2.23) transit and Philadelphia Transit (3.1) arrival cds, F.-V.F. Peters-Uota No. CSW-CC-1 Estimate $1,000 - 1,500. 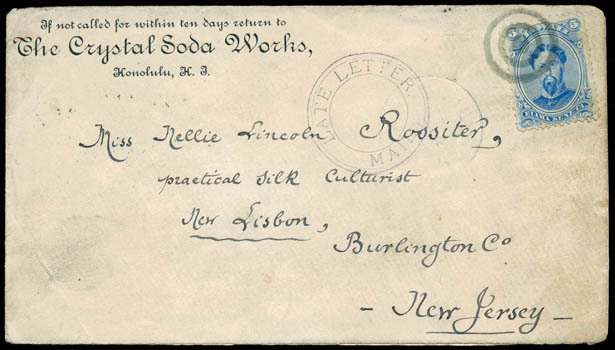 A RARE CRYSTAL SODA WORKS AD COVER USE WITH THE "LATE LETTER, MAIL" CIRCULAR HANDSTAMP. 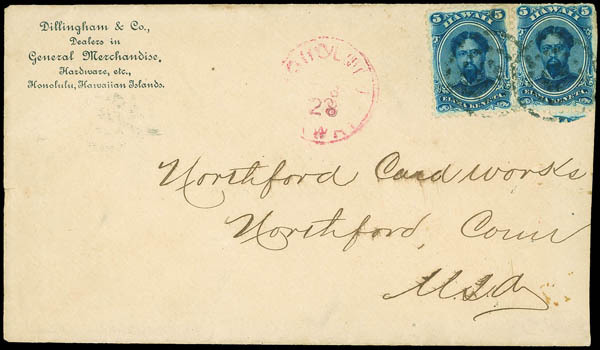 The "Late Letter, Mail" circular handstamp was known used July 2, 1882 to October 1, 1884. The marking reflects payment of an extra fee for processing a late letter. 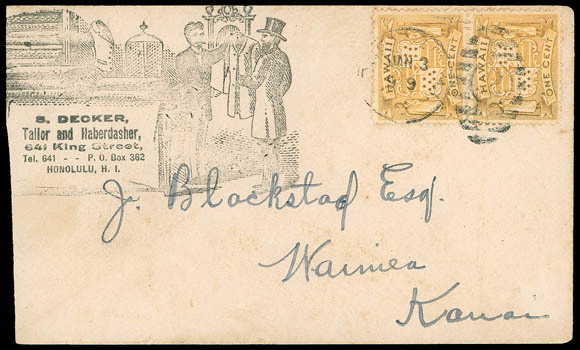 Starting in mid-1882, letters brought to the Honolulu Post Office after the posted closing time for a mail shipment were charged an additional 5¢ fee to have their letters included in the mail. The fee was charged more to discourage the practice of bringing in late letters than for revenue. A.G. Curtis, General Business Broker, Hilo, Hawaii, blue printed oval corner card, overstruck with additional purple "A.W. 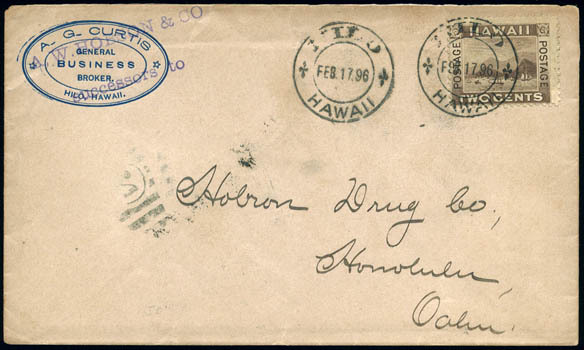 Hobron & Co. / Successors to" handstamp, on light buff cover to Hobron Drug Co., Honolulu, bearing 2¢ brown (75) tied by "Hilo, Hawaii, Feb. 17. 96" double-circle datestamp and additional strike adjacent, reverse with Honolulu (2.18) arrival duplex, Very Fine. Peters-Uota No. AGC-CC-1 Estimate $200 - 300. Theo. 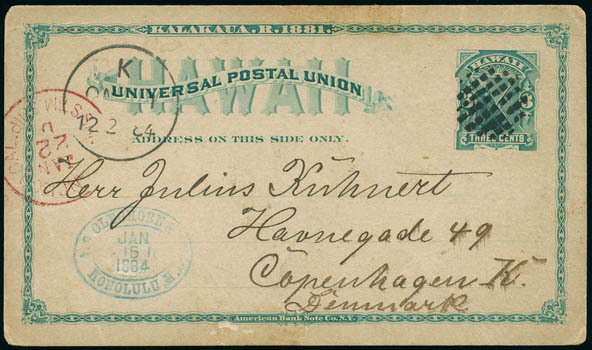 H. Davies & Co., Honolulu, H.I., printed corner card on cover with corners cut for fumigation bearing 5¢ blue (32) tied by "Honolulu H.I. Feb 20, 1900" duplex to Messrs. 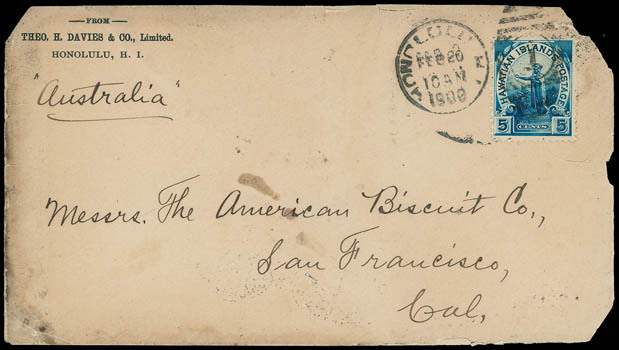 The American Biscuit Co., San Francisco Cal., manuscript "Australia" ship directive, reverse with San Francisco Feb. 27th arrival machine backstamp; faults, accompanied by unusual large "Cabin Passenger's Baggage, S.S. "Australia", Honolulu, Feb. 20, 1900, Inspected and Disinfected, U.S. Medical Inspector" black on orange baggage label; some faults, Fine. Peters-Uota No. TD-CC-2 Estimate $400 - 600. 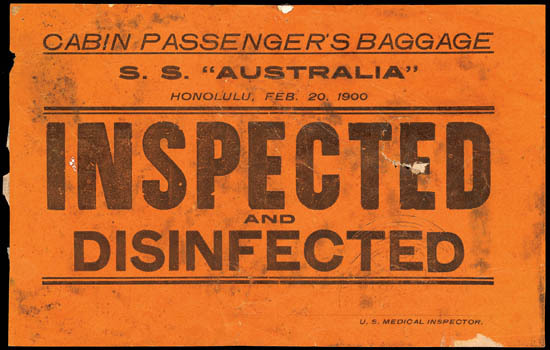 A RARE PAIR OF FUMIGATION ITEMS CARRIED ON THE SAME SAILING OF THE STEAMSHIP "AUSTRALIA" FROM HONOLULU FEB. 20TH. S. Decker, Tailor and Haberdasher, Honolulu, H.I., handstamped illustrated corner card showing a gentlemen's clothing store scene with haberdasher helping customer, on cover to Waimea, Kauai bearing 1¢ yellow (74) tied by partial "Honolulu. H.I. Jan 3 '99" duplex, purple Waimea (1.4) receiving backstamp; reduced at left just affecting corner card, Fine. Peters-Uota No. SD-IL-1 Estimate $400 - 600. ONE OF ONLY TWO RECORDED EXAMPLES OF THE S. DECKER ILLUSTRATED ADVERTISING CORNER CARD HANDSTAMP. Dillingham & Co., Dealers in General Merchandise, Hardware, etc., Honolulu, Hawaiian Islands., printed corner card on cover to Northford Conn. bearing two 5¢ blue (32) singles, tied by segmented three-rings cancels, partial red "Honolulu, Hawaii, Feb 28" origin cds, red San Francisco Paid All (3.18) transit backstamp, reverse with blue "Monsarrat & Lover / General Agent / Honolulu, Oahu, H,I." blue three-line handstamp; reduced at right slightly affecting 5¢, F.-V.F. Peters-Uota No. DC-CC-2 Estimate $300 - 400. THE ONLY RECORDED EXAMPLE OF THIS CORNER CARD. 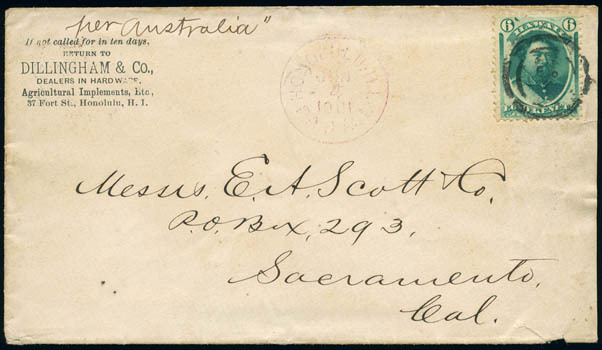 Dillingham & Co., Dealers in Hardware, Honolulu, H.I., corner card on cover with manuscript "per Australia" endorsement to E.A. Scott & Co., Sacramento Cal. bearing 6¢ yellow green (33) tied by patent cancel (Gregory ring3-21(patent)), red "Honolulu, H.I., Paid All, Jun 4, 1881" cds (MH 237.12, R4), reverse with red San Francisco (6.14) transit and Sacramento (6.14) arrival cds; small cover flaw lower right, Very Fine. Peters-Uota No. DC-CC-1 Estimate $200 - 300.